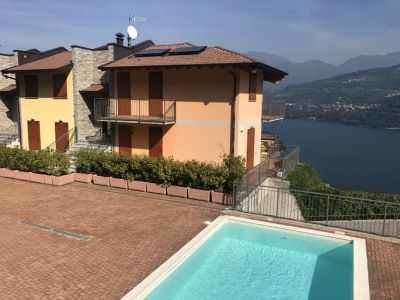 Just 800 meters from the lake, in the very first hill with spectacular views of Montisola and Lake Iseo, brand new jewel residence with swimming pool and beautiful solarium area. Fully FURNISHED layout on the first floor with private lake front terrace composed of: entrance , living room, kitchenette, 1 bedroom, bathroom. Always Lake Iseo attracts writers from all over the world and curious artists, thinkers and tourists: an enchanting and romantic basin, surrounded by olive and chestnut trees, set like a jewel among the mountains and embraced by hills that gently slope towards Franciacorta, land of extraordinary wines. Sun Montisola (the largest European lake island, which rises to dominate the lake from its own heart), a bucolic setting offers the possibility of breathtaking walks, with a fantastic total view and a perfect shot of eye on the two islets of San Paolo and Loreto that, not far away, seem to accompany their older sister. The summer activities and water sports that can be practiced are many and of great appeal. While in winter, the ski slopes of Valle Camonica, only about thirty kilometers away, represent the fixed destination of many fans. And throughout the year very varied is the proposal of cultural events, musical festivals and folklore markets, which at every opportunity present foods and products of the territory, production of local crafts, uses and customs typical of the lake area.